Infrastructure waste (such as road sweepings, gully waste, sewer sludge and grit slurry from grit chambers) contains mineral particles (sand and grit), debris (e.g. packing and wrapping material), other coarse solids (e.g. stones, wood, glass and metals) and organic matter (e.g. leaves and grass). Our technologies for the treatment of such mineral-rich waste remove debris and other coarse solids. We wash and compact them, so that they can be incinerated as solid waste. The mineral fraction, containing less than 3 % volatiles, is reusable as construction material, e.g. for road and pipe bedding. After composting, the organic fraction can be utilized as soil material, e.g. for landscaping or land reclamation. Mineral-rich infrastructure waste is directly or indirectly dumped into a Receiving or Storage Bunker with an integrated screw conveyor. The waste is forwarded into our HUBER Wash Drum RoSF9 wherein it is submersed in wash water and homogenized. 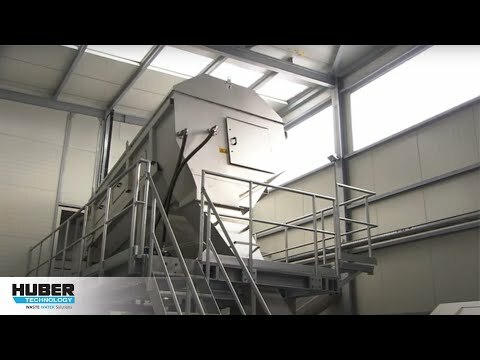 Coarse solids (> 10 mm) are screened and washed and then dewatered and compressed in our coarse solids compactor HUBER ROTAMAT® Ro7. Fine solids (< 10 mm) are suspended in the wash water and drained. The suspension is pumped to our HUBER Coanda Grit Washer RoSF4. In its fluidized bed mineral solids and organic solids are separated. The mineral fraction is simultaneously washed and then dewatered (<3 % volatiles, < 10 % water). Grit can be screened off and reused as road grit. The washed mineral fraction is used as construction material. We use a HUBER Fine Screen ROTAMAT® Ro1 to remove organic solids (> 1 mm) from the suspension. They are simultaneously washed, dewatered and compacted (> 30 %DS). The screened wastewater can directly be recycled as wash water to the wash drum. Alternatively, it flows through a HUBER Longitudinal Grit Trap ROTAMAT® Ro6, wherein even very fine sand (< 0.2 mm) is removed, is then flocculated and flows through a settling tank and to a HUBER Dissolved Air Flotation Plant HDF for removal of remaining colloids. 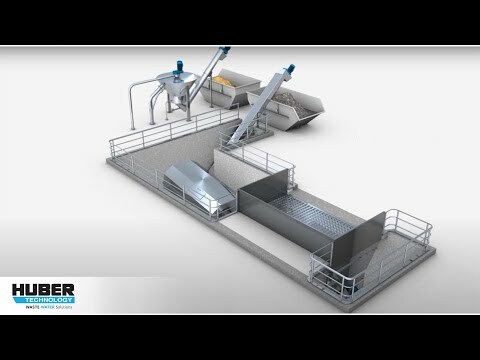 The thus treated wastewater is also recycled as wash and spray water to the grit washer and fine screen. The separated sludge is dewatered in our HUBER Screw Press S-PRESS (> 50 %DS). Together with the organic solids it is composted and finally recycled as soil material. If the treatment plant is located at a wastewater treatment plant, the organic suspension is simply added to the incoming wastewater for common treatment. In this case, neither a fine screen nor a grit chamber, flotation plant or screw press is needed. When we implement our solutions, we also provide our well-proven HUBER stainless steel components, e.g. Screw Conveyors or Manhole Covers.